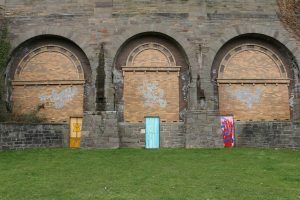 20 unloved doors in Dundee’s Stobswell area have received a creative lick of paint this month as part of unique street art project. Following the success of the Open/Close Dundee, and with the support of Hillcrest and Dulux, volunteer organiser Russell Pepper is launching Open/Close Stobswell. Russell said: “I’m extremely grateful for the support Hillcrest has given Open/Close. 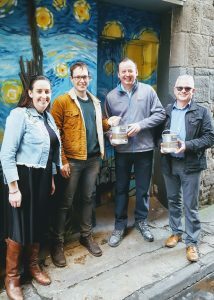 “They have helped us find doors and even locations for large scale murals, are taking on community consultation roles and are being incredibly supportive and proactive. “They have even contacted Dulux on our behalf, who were then kind enough to donate enough primer for the entire project. Tenant participation officer, Emily McCulley said: “I have really enjoyed working with Open Close Dundee and our local Dulux Decorators Centre. “I really admire the way the Open/Close Dundee have developed relationships with the Stobswell Community Forum, citizens and landlords of Stobswell to launch this project. Dulux regional account manager, Colin J Calyle, said: “Dulux Decorator Centre Dundee is delighted to support the Open/Close project. “The project sits within our company vision to help inspire and enable beautiful living spaces. The doors will launch with a tour on Saturday May 5 2018 with additional tours running on Saturdays throughout May. Tours start at 12.30 pm at Tayview Community Garden on Robertson Street.